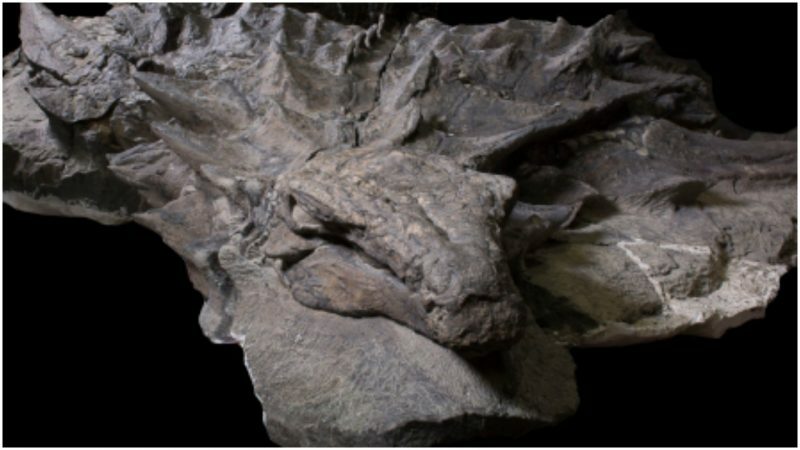 Six years after it was unearthed by miners, a remarkable fossil of a 110-million-year-old nodosaur is now on public display as part of the “Grounds for Discovery” exhibition at the Royal Tyrrell Museum in Alberta, Canada. After examining it, scientists concluded that the Suncor nodosaur was actually a new species of nodosaurid, a type of armored dinosaur that existed during the Cretaceous period. Speaking of geological periods and system spans, the Cretaceous period spanned some 79 million years, from the end of the Jurassic period 145 million years ago to the beginning of the Paleogene period some 66 million years ago. What’s remarkable about the fossil is that it is one of the best-preserved dinosaur fossils ever excavated, in terms of its size and condition. Not only are the armor-nodules and spikes preserved in their life proportions, but the remains of their keratin sheaths and even overlying skin have survived. At first, the fossil was believed to be whole, but scientists concluded it was only the front half, from the snout to the hip, that was intact. The almost flawless state in which it was found was most likely a result of the way the creature died, reported National Geographic. The magazine suggests that death most likely occurred during a flood, after which the specimen drifted along a river, eventually being carried out to sea. It then sank, upside-down, to the sea floor shortly after its death. The top half of the body was probably quickly buried in the seabed with minimal deformation. The seabed where it settled was mineral-rich, and this helped preserve the dinosaur in a lifelike state. National Geographic puts the chances of finding a dinosaur at this astonishing level of fossilization “as rare as winning the lottery.” Most of the time, it is only bones and teeth that survive, and only in very rare cases do minerals replace soft tissues before decay. It’s never guaranteed that a fossil will keep the shape it had when alive. In comparison, feathered dinosaurs unearthed in China have been found squished flat. Also, similar-looking hadrosaurid “mummies” in North America look rather wrinkled and contracted, due to their partial mummification, a process that takes place prior to fossilization. That has not been the case with the Suncor dinosaur, the remains of which are remarkable for the way they’ve been preserved with the creature’s three-dimensional form intact, complete with soft tissue. Study of the chemicals in the remnants of the skin and scales hints that the nodosaur might have had a reddish color in real life. The oil deposits in which the fossil was found are formed from ancient plankton and other marine life, and during the Cretaceous period, the site, just 19 miles north of Fort McMurray, had been an inland sea. The fossil was discovered at about 1:30 p.m. on March 21, 2011, by a Suncor employee named Shawn Funk. Reportedly, Funk at once recognized the unusual nature of the pieces of the specimen, as did his supervisor, Mike Gratton. Two days after the remains were discovered, Royal Tyrrell Museum scientists Donald Henderson and Darren Tanke paid a visit to the mine. Based on photographs, they had first thought the remains were that of a plesiosaur or possibly another marine reptile. Surprisingly, the fossil was one of a dinosaur, in spite of the fact that no land animals had been unearthed in the oil sands previously. The museum staff and Suncor employees took 14 days to entirely remove all pieces of the fossil. A few pieces had been broken free by Funk, but the bulk of the specimen was still buried some 26 feet up a 39-foot cliffside. As they lifted the major piece of rock holding the fossil, it broke under its own weight into a couple of pieces. Nevertheless, museum staff successfully transported to the Royal Tyrrell Museum. It must have been a long and meticulous process piecing together an 18-foot long, plant-eating armored dinosaur that weighed 3,000 pounds. Not to mention its two 20-inch-long spikes on its shoulders. But all the effort has paid off, and the nearly perfect specimen can be now seen at the Royal Tyrrell Museum. Research features of the nodosaur are also available in the June 2017 issue of the National Geographic, online and in print. The features also have an interactive 3D model of the dinosaur and a more thorough explanation as to how it came to be fossilized. Pretty cool, eh?